The National Online Property & Casualty Adjuster Training Program is the nation’s first and only online adjuster training program that teaches what it means and what it takes to be an adjuster! The comprehensive online course introduces students to the world of insurance adjusting and claims practices in all 50 states, including Alaska and Hawaii, by introducing them to the principles and objectives of adjusting as they apply to the major product lines of insurance, and requiring them to interact with course material through the analysis of coverage, interpretation of legal concepts, and application of adjusting practices. Over and over, this program has proven to be the finest and single-most comprehensive adjuster training course in the United States for reinforced learning and application of all lines of insurance and claims adjusting. The course is comprised of five sections: Introduction to Claims, Casualty Adjusting, Property Adjusting, Automobile Physical Damage Adjusting, and Residual Markets and Adjuster Practices. Each section offers a sequential, building-block approach to adjuster training that explains insurance principles, identifies factual scenarios with legal and contractual claim exposures, and concludes with best practice applications of claims analysis and adjustment. For the Final Program Exam (FPE), students must complete an extensive two-part Case Study from which 20 “application” style multiple-choice questions are presented. These are not simple “memorization” questions. They are the same kind of questions that would be required of real-world adjusters in the same position with the same facts as presented in the case study. Students will have three (3) attempts to successfully complete the FPE with a minimum passing score of 80%. After completion, students can review their exam results, and, if necessary, take time to go back and research the course lessons for questions they missed before beginning their 2nd or 3rd attempt. A powerful hurricane is schedule for landfall in 72 hours as the main character heads to the local “national chain” hardware to purchase a home-generator for installation. His adventures and exploits embroil the student in numerous scenarios and events that take one through almost every aspect of Casualty claims handling and adjustment. The issues to be considered and the decisions the student must make are identical to the work one would enjoy as a Casualty adjuster. The hurricane makes landfall with devastating force and the main character’s home has been severely damaged. The student, as his property adjuster, will be required to consider various insurance coverages and types of damage, as well as calculate and recommend appropriate payment of insurance benefits under various property policies. Students who fail to secure a minimum passing score of 80% on the FPE may reinstate and retake the course for a fee of $89.50. Otherwise, you can still rest assured that you have still gained a world of knowledge that others would have to work years to obtain, if ever they did. This course raises the bar of expectations for those who truly wish to not only increase their knowledge and understanding of what goes on in the “world of claims”, but to also enhance their apply the principles, concepts, and doctrines of insurance claims adjusting to real world situations. Students who achieve a minimum score of 80% or better will receive a "suitable for framing" Certificate of Completion as a testament to their determination and resolve to gain a solid foundation of knowledge in the field of property and casualty insurance, and completion of their first step along the continuum of professional training and development in the world of insurance adjusting and claims management. Students will also receive a formal "Letter of Commendation" from AE21 acknowledging and commending them on the significance of their accomplishment and qualifications for participation in the property and casualty insurance claims adjusting industry. This is not a pre-licensing course, nor does it contain state-specific information. If you live in a state that requires pre-licensing, you must take a state-approved pre-licensing course to be eligible for your state's exam. 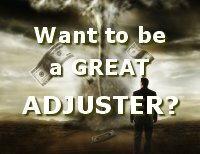 This course is best suited for students that live in a non-licensing adjuster state but who still want the information on becoming a great adjuster.